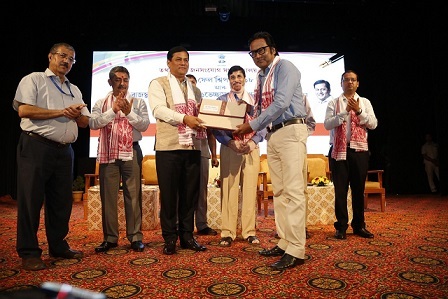 In an attempt to give the journalists a scope for in-depth study and aid research oriented solution to different socio-cultural issues, Assam Chief Minister Sarbananda Sonowal on Wednesday handed over Media Fellowship awarding letters to 20 journalists of the State including chief copy editor ofNortheast Now, Asif Ibrahim, during a programme held at Sri Sri Madhavdeva International Auditorium here on Wednesday. It may be noted that awarding Media Fellowship to the journalists is the first ever scheme of its kind launched in the State under the aegis of the Information and Public Relations Department under the leadership of the Chief Minister. In the same programme, Chief Minister Sonowal also ceremoniously flagged off a conducted press tour of the rural media persons on goodwill mission to Rajasthan. A total of 20 journalists have been selected from across the State for the conducted press tour from May 23 to June 3, 2018. The journalists would embark on their journey by flight on Thursday as the Chief Minister distributed media kits to the journalists. Speaking on the occasion, Chief Minister Sonowal said that in the last couple of years Assam has occupied global importance. Considering the location of Assam and the Centre’s endeavour of keeping Assam and other North Eastern states at the heart of India’s Act East Policy and the first ever global investors’ summit held at Guwahati, have enhanced the global recognition of the State. He also hailed the efforts of the journalists of Assam which contributed to Assam’s taking the limelight of an important global player. Sonowal also said that the fact that Guwahati is the Gateway to South East Asian Nations, people’s perception towards Assam has undergone a sea change and the media has contributed immensely towards that. Chief Minister Sonowal said that the Media Fellowship though given for 20 journalists this time would be extended its ambit to incorporate more journalists. 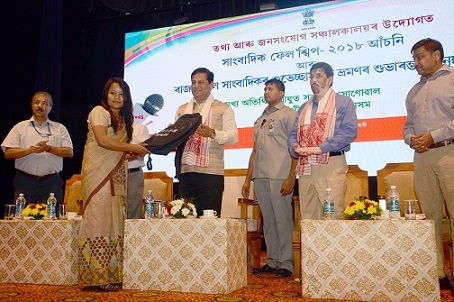 Acknowledging the role of the journalists in highlighting the issues and representing the aims and aspirations of the people of the state, Sonowal said that journalists are the conscience of the society and are working to strengthen the age-old bonding. Northeast Now’s chief copy editor Ibrahim will study on ‘Changing face of Assamese cinema: Challenges, obstacles and opportunities’. Sonowal said that to create value based society and good people, all four pillars of the society namely executive, legislature, judiciary and press have to work in unison. Besides, Chief Minister Sonowal said that the goodwill visit of the rural journalists for the three consecutive years to Gujarat, Madhya Pradesh and Rajsthan augured well in realising Prime Minister Narendra Modi’s ‘Ek Bharat Shrestha Bharat’. CM Sarbananda Sonowal distributing media kit to mark the inauguration of conducted press tour of rural media persons on Wednesday. He also said that the conducted tour of the media persons to Rajasthan would help in building healthy relations between the two states. This conducted press tour will lead to strengthening the age old friendship and camaraderie between Assam and Rajasthan. He also urged upon the 20 rural journalists undertaking the conducted press tour to be the ambassadors of Assam’s glorious history, art and culture and carry our message of love and friendship to Rajasthan. Sonowal also released an in-house journal ‘Antaranga’ of Information and Public Relations on the occasion. Speaking on the occasion, Media Advisor to the Chief Minister Hrishikesh Goswami said that the journalists in their bid to social reformation have to emerge like anti-virus. He said that the perspectives of journalists are different from that of the common people and therefore, they can play the role of a catalyst in giving positive momentum to the society. He said that the present State government under the leadership of Chief Minister Sarbananda Sonowal has taken several innovative schemes for the welfare of the journalists and asserted that in the coming days based on the suggestions of the journalists, the government would launch several other schemes. He also said that for the help of the journalists, next time the government would hold orientation workshop to help the journalists to prepare the project proposals. Director, Information and Public Relations Rajib Prakash Baruah while giving welcome address gave a brief snapshot of different schemes that the directorate has taken so far. A number of editors and senior journalists were also present on the occasion.